How can nurseries and pre-schools run a smooth drop-off and collection procedure without compromising security? 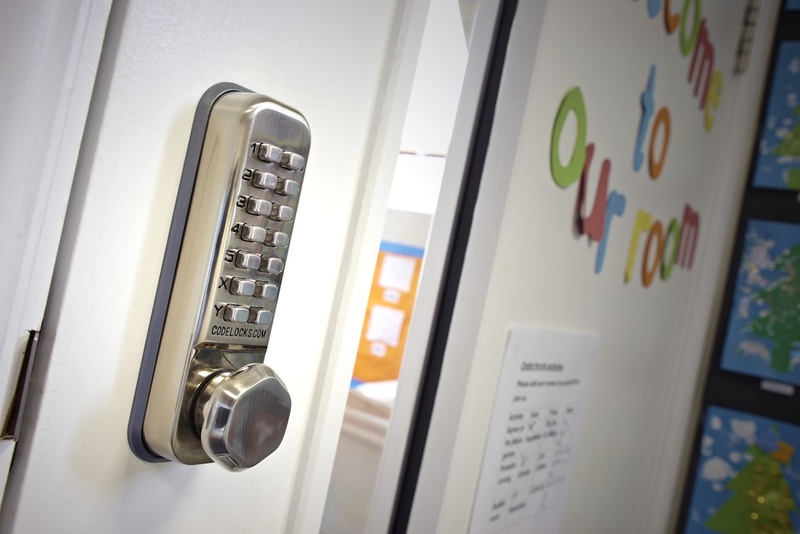 Find out how Tigers Day Nursery in Thatcham took control of access issues using keyless door locks. When a nursery or pre-school offers multiple sessions, the period of time where parents drop off and collect their children can be very busy especially if one member of staff is continuously leaving the room to answer the main door. The challenge for nurseries and pre-schools is how to manage this busy period with minimal impact on staff time, while at the same time making sure security procedures are adhered to. With one simple change to the door locks at Tigers Day Nursery in Thatcham, Berkshire parents can safely collect their children without having to wait outside in all weathers. Tigers Day Nursery offers three sessions; a full day, a morning and an afternoon, and has up to 120 children passing through its doors every day. The nursery has 11 rooms for the children and is spread over two different levels. It also has a dedicated training centre, which is often used by other nurseries in the area. The main door to the nursery was previously locked at all times for security. If parents wanted to drop off or collect their children, they would ring the bell and a member of staff would come and answer the door. As not all parents collect at the same time, inevitably there would be times when parents would have to wait until a staff member was free to come and let them in. Add to this a number of professional or service visits during the day, and staff spent a considerable amount of time running up and down the stairs answering the doorbell. To simplify this process, but without compromising on security, the nursery added Codelocks push-button locks to all the doors on the main internal rooms. The keyless locks operate with a four or five-digit code that is only known to staff. The main door is now left unlocked during the day so that parents can come straight into the building and wait directly outside the room their child is in. Each of these rooms has a glass window so staff can clearly see who is waiting and there is a bell to attract attention. Parents are pleased they no longer have to wait outside and they are reassured that security is better than ever. Access remains restricted for parents and visitors and if staff do not recognise the person standing at the room door, they do not open it. The nursery operates a password system so that other members of the family or friends can be authorised to collect the children. The code for the door is never given to parents or to any work experience students. Regular changes to the access codes on the locks will ensure they remain effective. If a member of staff leaves, for example, the codes can be changed immediately so that security is not compromised. The new keypad locks have enabled the nursery to control their access issues while making improvements to security. Nursery manager, Nicola Barkhouse plans to extend the use of Codelocks to other areas of the nursery. As well as the staff room and training centre, she also plans to add locks on all the office doors as well. The new routine is much more convenient for everyone; staff no longer have to leave a room in order to answer the main door and parents do not have to wait outside. The door locks are easy to fit and easy to programme, and make a huge difference to the smooth day-to-day running of the nursery. To see our full range of mechanical and electronic locks for use on doors in nurseries, pre-schools, school and colleges visit our website, or give us a call on 0800 393405.